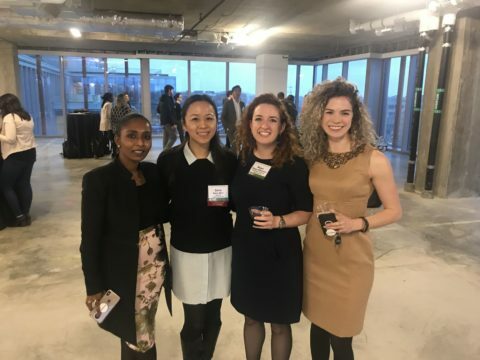 On March 21, 2019, the ULI Young Leaders Group Programs Committee hosted “Celebrating the Past While Embracing the Future: How 655 New York Avenue is revitalizing the Historic Mount Vernon Triangle.” The event provided a behind-the-scenes look into the nearly 20-year development process of one of Washington, DC’s most exciting and impressive mixed-use developments. Brought to life through a partnership between Douglas Development and Brookfield Properties, 655 New York Avenue comprises nearly an entire city block and incorporates 19 historic properties and a new 12 -story glass office building. 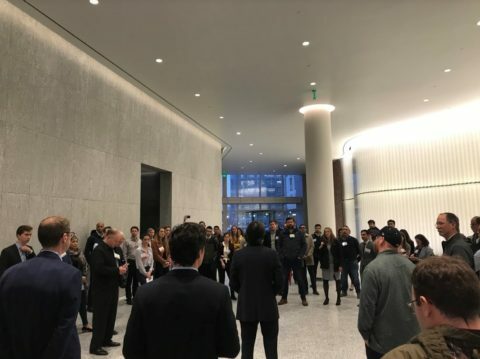 The event kicked off in the East Lobby of 655 New York Avenue, where attendees were able to network in the open lobby space before touring the development that seamlessly blends the old with the new. 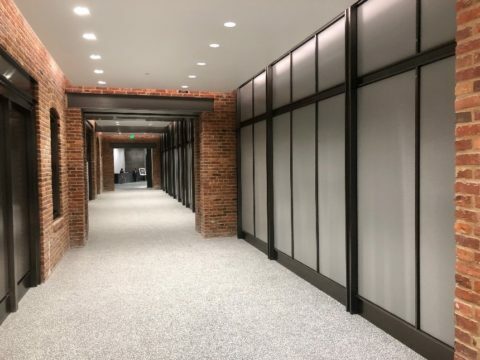 The tour began in one of the building’s historic ground-floor retail bays along New York Avenue, where Drew Turner of Douglass Development spoke about the history and challenges of amassing the site’s 19 designated historic structures. Not only were several historic buildings moved to new locations within the site, others were disassembled and then rebuilt as part of the construction process to accommodate the ultimate building design. Do we count the Penthouse? 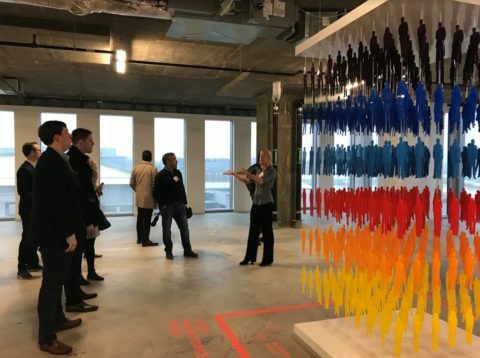 The tour continued to the third floor of a series of historical buildings along 7th Street NW, where John Landry discussed the construction process and timeline. 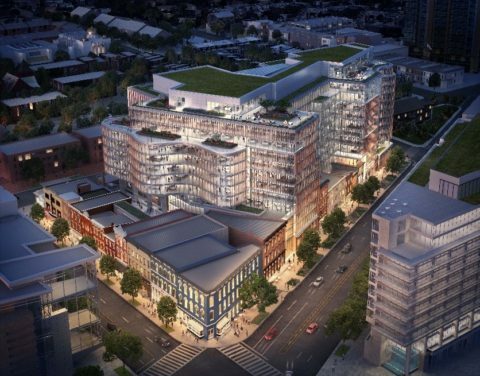 DC-based General Contractor Davis Construction managed the project’s construction and completed the development on time. John also talked about the site’s interior design, including the lobby’s art installations and stone materials sourced from Turkey and Canada. 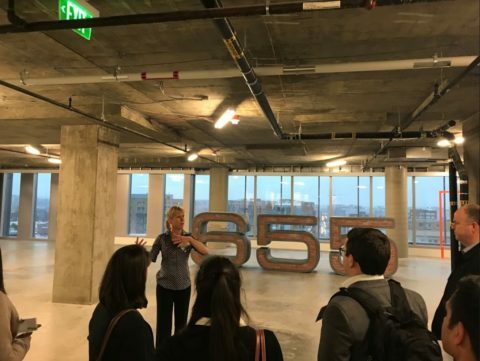 The tour was concluded by Melanie Stehmer-Townsend on the 11th floor, which currently serves as the marketing and leasing center. The entire site is comprised of 79,000 SF of retail and 678,000 SF of office space anchored by United Healthcare and EAB, formerly known as The Advisory Board Co. Melanie highlighted many of the site’s attractions, including nearby restaurants, bars, retail and cultural attractions; the adjacent Convention Center and to-be-delivered Apple flagship store; and the immediate Shaw neighborhood, which is one of the fastest growing residential neighborhoods in DC and a destination for the millennial workforce. A networking reception was held in the leasing center after the tours concluded. 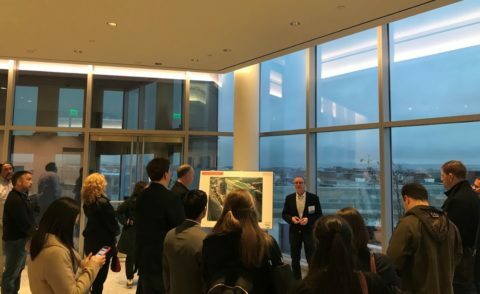 Overall, the evening was a great success, offering attendees the opportunity to learn more about one of DC’s newest and most complex mixed-use developments. 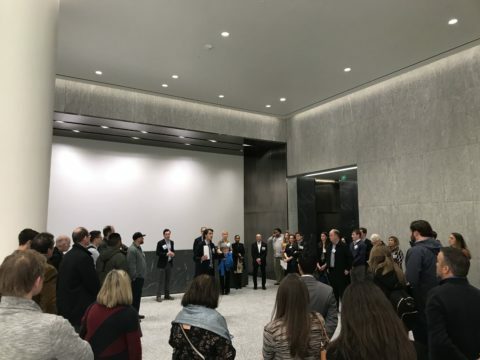 The ULI Young Leaders Group Programs Committee graciously thanks Brookfield Properties, Douglass Development Corporation, and Shalom Baranes Associates for their participation.